Yesterday was day six of the kids' spring break. The first few days were spent in a whirlwind of Easter festivities. We kept occupied with the whole shopping, cooking, egg-dying, egg hunting, ham-devouring, candy-overload and family-gathering aspect of it all. Once Monday rolled around and my husband left for the week for work (he's gone four days at a time out of state each week), the kiddos and I were left to our own devices with (pretty much) an empty schedule for several days. May I just say that I enjoy very little more in life than chilling out at home with my children while we watch movies, play games, read, take naps and do just about nothing ... all with no set schedule and no where to be. Last night we enjoyed lasagna in the slow cooker. I've tried making lasagna in the slow cooker before. It wasn't a pretty sight! The edges burned before the center was completely cooked and getting rectangular noodles to fit in an oval slow cooker was a nightmare. I decided to give it another whirl using the same method that I use for my slow cooker oatmeal - prepare the lasagna in disposable aluminum pans and create a "water bath" within the slow cooker to allow for steam to help gently cook the lasagna. For just a couple of bucks, you can buy disposable aluminum pans in just about every shape and size. I used rectangular ones that were about eight inches long and five or six inches wide. This size fits great in my slow cooker insert. You'll have to see what will fit best in yours. I stack the two pans on top of each other, but I use something in between them so that the top one doesn't come into contact with or crush the bottom one. Experiment with what works for you. I use metal tongs or a couple of wooden skewers. You could, also, possibly lay a few butter knives across the top of the bottom pan. 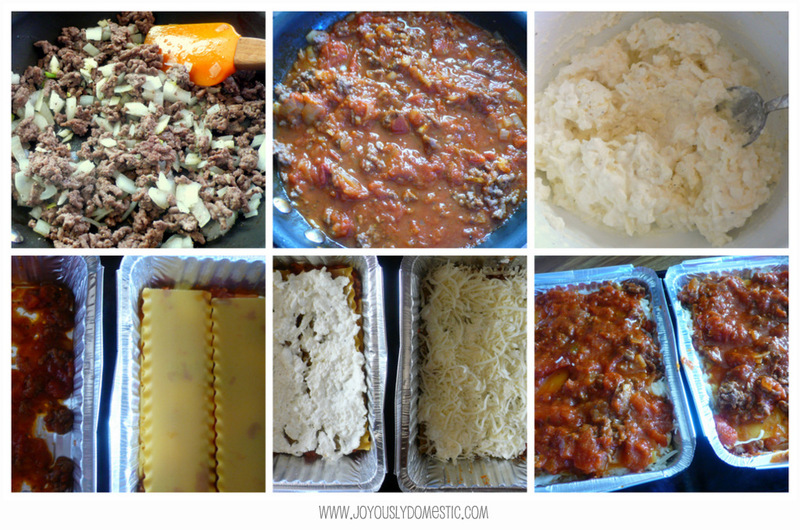 I used my recipe below for this method, but I'm sure you could try this techinique using your own fabulous lasagna recipe instead. Yields 8 - 10 servings. Brown ground beef with the onion and garlic until beef is fully cooked. Add in a little salt and pepper to taste. Combine the marinara with the cooked ground beef. Set aside. Grease two aluminum pans. Set aside. Combine the ricotta, cottage cheese and one cup of the mozzarella. Season with salt and pepper to taste. Set aside. Begin assembling the lasagnas by spreading a couple of spoonfuls of the marinara/ground beef mixture into the bottom of each pan. Lay two lasagna noodles side-by-side (broken to fit) in each pan. Spread a spoonful of the ricotta/cottage cheese mixture across the noodles in each pan. Sprinkle on a handful of mozzarella in each pan. Repeat the layers three more times ... ending with a layer of the marinara/ground beef mixture on top. Be sure to reserve about a cup of the mozzarella cheese to add to the top toward the end of cooking. Place one of the pans in the bottom of the slow cooker. Place something on top of the pan to ensure that the top pan does not come into contact with the bottom pan (see explanation in top section of this post). Place second pan on top. Carefully add in one cup of hot water to the bottom of the slow cooker insert. Be sure not to get any of the water into the pans of lasagna. Lid and cook on low for 4 - 4 1/2 hours. Around the four-hour mark (and once you see that everything is cooked through and the noodles are tender), remove the top pan and sprinkle the remaining mozzarella cheese on the top of each lasagna. Return the top pan to the slow cooker and finish cooking for another 30 - 40 minutes or until cheese is melted and bubbly. Once lasagna is done, remove pans from slow cooker and allow lasagna to rest for about ten minutes prior to serving. NOTE: I'm thinking that the lasagna could be assembled the night before you plan to cook it, but I haven't tried that yet. I'm not sure if doing so would affect the cooking time due to the possibility of the noodles softening during overnight refrigeration. If you try this, please do let me know. If you only need around four servings (the equivalent to one pan), the additional pan of lasagna could be frozen (uncooked) and saved for another meal. I am making slow cooker lasagana as we speak! I cannot wait to get home and eat! My kids and I enjoy quiet time like this as well, it is very rejuvenating. I am just loving this idea. Wish I would have known this when I stocked my friend's freezer for after she had a baby. This would have been the perfect meal! Hi, Lori. Hope you had a great Easter! So nice to see ya on here today! :) Yes, this is a PERFECT idea for taking gifts of meals to others. :) My mind is racing of other casserole-type dinners that I can do this way in the future. We really enjoyed it and it worked perfectly. I don't when making it in the slow cooker. Between the long length of time it cooks (as compared to in the oven) and the water you pour into the insert to create a steamy atmosphere within the slow cooker, mine is always perfect. But, if you're worried about the issue, adding a little water to the sauce shouldn't be an issue (especially if your sauce is on the thicker side) ... so long as you don't add too much. Since the lasagna is cooked with the lid on the slow cooker, not much of the liquid within the slow cooker evaporates. I would hate to have you end up with super soupy lasagna. Good luck! Thank you for visiting and for the question! Hi - I'm new here! 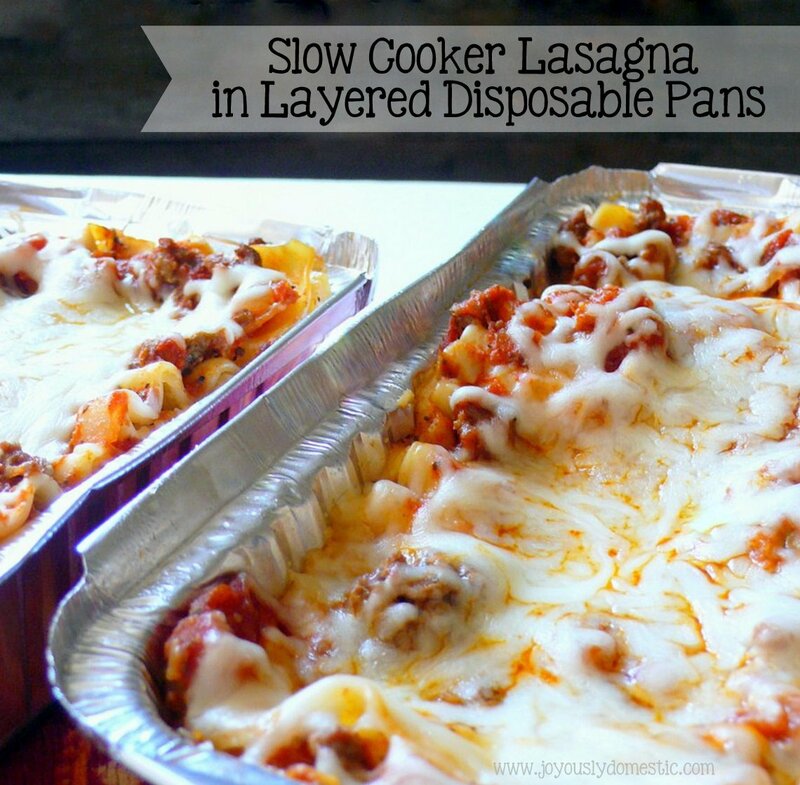 Although my slow cooker lasagna does come out perfect every time, I LOVE the idea of using the pans - especially when I am making this as a meal for someone because I don't have to send my entire crock over and be without it for several days. To answer your question, I prepare MANY crockpot meals the night before and have never found the cooking time or quality of the meal affected. Thanks for this awesome tip!